We know what you’re thinking. A quick guide to what-a? Schema (pronounced shee-mah) might sound foreign and complicated, but we’re here to help you easily master it. Learn to properly use schema and your website listing on search engine results pages will be detailed, distinct and get more clicks. 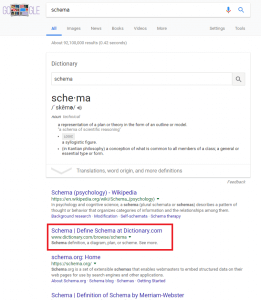 Schema is structured data that translates web page content specifically to search engines telling them exactly what the website is all about. It is literally language designed to make your content easier to understand by search engines. Created by Google, Bing, and Yahoo, the idea was for all developers and web users to have access to the same vocabulary. Thus making it easy to communicate with search engines and allowing everyone to reap the benefits equally. This shared language is constantly growing and expanding as its developed by a collaborative online community. The website Schema.org provides a list of these “shared code vocabularies”, separated down into infinite categories. So, how does it all work? Schema is a piece of website code you that helps search engines display results in a certain. It also promotes search engines to publish more informative results for users. Basically, schema sends out search engine friendly signals that provide Google with the appropriate context of your website’s content. Google has it included as a ranking factor algorithm, meaning it directly impacts your search rankings. The better your website communicates with search engines, the better it will rank on search engine results pages. Plus, the more information users see in the results pages, the more helpful it is to them. The more information a user has, the more likely they will click on the appropriate links. A normal snippet returned by a search engine will simply show the website’s title, the URL and a short description of what the web page is about. Like this screenshot example of a quick Google search for “schema”. As you can see, this snippet shows the header in blue, the URL in green and the description in black text. The schema markup creates a rich snippet, going beyond the basic data and returning extra information between the URL and the description. A rich snippet may include an image, a star rating, a review, a map or a quote. You will notice this rich snippet includes a star rating and address between the URL and business description. 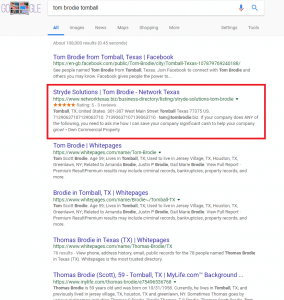 This specific rating is for Tom’s business Stryde Solutions. The same type of ratings are displayed for services, products and more. So which snippet do you prefer? The rich snippet of course. It’s more aesthetically pleasing and eye catching. It also gives the user that extra bit of information to make them more likely to click on your site. 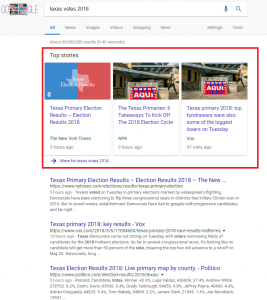 The structured the data for the rich snippet was communicate through the markup to the search engine, which in return displays more meaningful results. Here is an example of an article rich snippet. This specialized markup for news articles and blogs sets content apart from others in a carousel search engine result. Again this translates to qualified clicks for your website. Finally here is an example of an event markup. By highlighting the dates, event and venue you are more likely to attract users to attend. 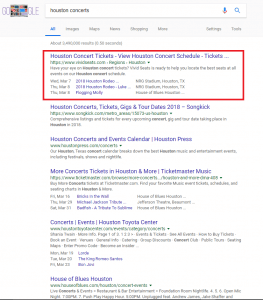 Hopefully these examples are helping give you an overview of what website schema markup can do and how helpful it can be in your own online marketing strategy. Unless you are an experienced coder, getting the correct mark ups on your website can be a daunting task. Even for experience coders, using a tool to easily create the markups is a no brainer. That’s why we highly recommend Schema Pro – a WordPress plugin that automatically codes your website into the shared coding vocabulary to efficiently communicate with search engines. Once you select your website’s schema category, there’s just 2 more simple steps to creating the appropriate schema for all your web pages. You create the rules to tell the plugin which pages and posts to add schema to. From there you will map your content. Schema Pro is one of many progressive plugins included KartHost’s EZWP Builder – the quickest, easiest way to build or re-do your WordPress site. KartHost’s™ EZWP Builder is packed with even more helpful tools to get you started in building and maintaining your best website ever.